Social media is a funny thing. It’s like the weather. It can be massive, beautiful, serene, rough, deceitful, unpredictable and most of all persistently undefeated. If you live long enough surely you will witness or experience all of it’s glory and terror. Such is the case as Hurricane Harvey laboriously rained down on Southeast Texas causing gargantuan flooding previously unseen in the history of American soil. As the death toll increases and the displaced are multiplied by tens of thousands, copious amounts of citizens in the affected areas have transformed themselves into super heroes. Untrained in the skills of rescue they have pulled people from the dredge of the water’s unmerciful all-consuming invasion. People have been snatched out of vehicles, homes, rooftops, taking nothing but the clothes on their backs. A furniture store owner converted his warehouse into a shelter. He reassigned mattresses slated to be sold for profit into beds to comfort the displaced and afflicted. A multitude of citizens from around the country have converged to the flooded areas, donated monies and or supplies providing for basic human needs. As calamitous as Harvey’s wrath has been, like other grievous events in American and human history, ordinary citizens have shown extraordinary amounts of resolution to help mostly total strangers simply out of conscious. And then there was Joel Osteen and his Lakewood Church. As the floods increased and dry spaces decreased, Lakewood’s building (formerly the Compaq Center, home of the NBA’s Houston Rockets) was reticent to open it’s doors to the displaced. Twitter got ahold of that story and tore into the mega church pastor shaming him before the world. Subsequently, Lakewood’s PR team reacted quickly in claiming on its own social media spaces that the church was flooded. They even went as far as posting photos of a flooded building to news stations to illustrate they’re inability to open its doors. Where the PR team failed is in not recognizing the aforementioned point. The internet is undefeated. I could have told them that lie would be quickly dispelled. It took only hours to confirm that the building was not flooded on the days in question and the church had to backtrack. Lakewood was pressured into opening its doors. 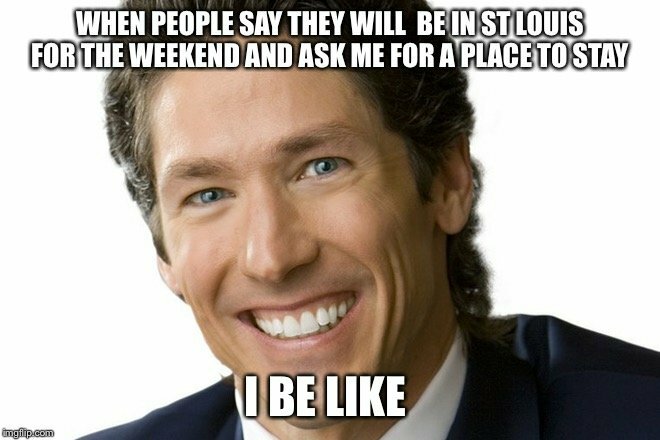 Mr. Osteen made the rounds on network and cable news programs claiming that the church was open and willing to serve their suffering neighbors all along. The intent of this article is not to criticize Mr. Osteen. I’ve already done that within my social media spaces. I’ve expressed that it’s all fun and games when you get to play ministry and collect the spoils thereof. But when it comes to receiving dirty smelly and desperate strangers into your well maintained and polished made for TV acropolis, that’s a reality of alternative dimensions. Regardless of how I feel about his initial decision, its his building to do with it as he pleases. What struck me as much as the contempt I feel about Osteen’s initial inaction, was the comments I read from his Christian followers to the righteous criticisms he received. Their response was not to encourage their beloved minister to action. Instead, they yielding a shield to protect Osteen from his Twitter beating and made excuses for why America’s pastor didn’t step up. First it was the flood that was initially claimed by the ministry spokespeople. After that was debunked it was how Lakewood was not staffed to handle such a magnitude of people. “Remember the Superdome,” one exclaimed, referencing the debacle during Hurricane Katrina. I even read where Christians challenged the Muslim community by asking, “How many mosques were opened to house the displaced and why aren’t they being taken to the woodshed?” That statement received many affirmative responses. “Good question,” many chimed in. One person even Google searched how many Mosques are in the Houston metropolitan area. But this is a consistent theme in religious circles. Parishioners and people of faith are often so protective of their leaders that they often allow them to get away with heinous acts. They refuse to hold them accountable thereby making them untouchable. Accountability is a two way street. But often the faithful fork over the integrity they are charged to have as they occupy the pews on Sunday morning. When those outside their faith in turn point out malfeasance, instead of reflection they offer deflection. This is how an Eddie Long could maintain a ministry despite his predatory sexual relations with young men he was supposed to be mentoring. It’s how a Creflo Dollar can ask his church members (most of whom are of lower to middle class) to pay for a private jet. It’s how a Mark Burns, Steve Parson and Harry Jackson, just to name a few, can sell their ministerial souls to capitalism and Donald Trump, no matter what #45 he says or does, and maintain a thriving African-American membership. They exchange the charge of being fully functioning parishioners to become cult-like sycophants. This isn’t just a national issue. It’s a local one as well. I argue that if you love Joel and respect his ministry, challenge him when he’s wrong and help him to be a better minister. This could have been a lesson for him. But Christians dropped the ball in their defense of him and allowed Twitter to become the taskmaster instead. Many won’t even admit that he lied about the flooding. How crazy is that? The church missed an opportunity towards spiritual growth. The “World” did their job for them. Mr. Osteen doesn’t get better as a minister or a leader because he can hide under the blanket of being bullied by the world. A great friend of mine often says, “You get the leadership you deserve!” This isn’t just for ministry. It’s for politics as well. Far too many of us stand by and offer nothing of substance to shape a leadership that will work in our interest, and then complain about the results. It’s OK to hold leaders up and esteem them; including those in ministry. However, we must be careful to kill our sacred cows. If not, we become willing sheep ready for the slaughter.